Kathin Chibor Dan - the literal meaning of which is "offering of difficult monk robe" is an annual religious festival during which Buddhist donates different items for the living of the monks including their robe made out of the cloth weaved in their own looms. 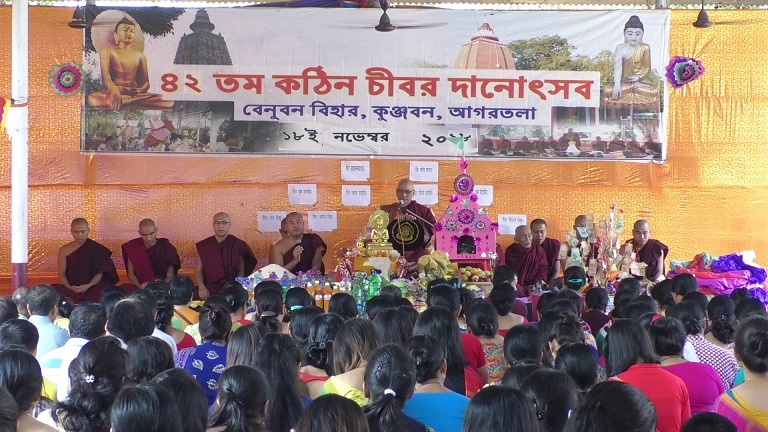 Hundreds of Buddhists congregated in India’s northeastern Tripura’s historical monastery ‘Venuban Vihar’ to participate in the 42nd Kathin Chibor Dan festival, one of the main religious festivals of the Buddhist community. Kathin Chibor Dan – the literal meaning of which is “offering of difficult monk robe” is an annual religious festival during which Buddhist donates different items for the living of the monks including their robe made out of the cloth weaved in their own looms. Devotees said the festival is celebrated throughout the world within one month of the conclusion of ‘Prabarana Purnima’, the full moon day of the Hindu month of Ashwini. During ‘Maha Kathin Chibor Dan’, one of the most significant religious festivals of the Buddhists, devotees donate robes to the monks which are made of cotton and weaved by devotees overnight and consider is the biggest symbol of sacrifice, through which one can achieve salvation. However, with fast and complicated modern life now devotees mostly buy the robes and donate them to the monks. According to the ritual a devotee has to reel yarn out of cotton, weave cloth out of that and colour it within 24 hours and donate it to a monk.